The fifth round of the China-US Strategic and Economic Dialogue (S&ED) has begun in Washington, with security and economics set to be high on the agenda. Chinese Vice Premier Wang Yang and State Councillor Yang Jiechi will hold discussions with their US counterparts Secretary of State John Kerry and Treasury Secretary Jacob Lew. While Jacob Lew has insisted on the Asian nation speeding up reforms, the Chinese side has said that consensus will take time. Wang said: “I think it will take us at least five years to resolve those issues and reach consensus. “Like the United States, we will never accept views, however presented, that undermine our basic system or national interests”. The two sides are also discussing cyber-security and climate change during the two-day meet in Washington. “Our agenda is broad and it cuts across strategic and economic tracks. And as an outgrowth of the S&ED, we’ve added the strategic security dialogue in 2011 and new working groups on cyber issues and on climate change this year,” Kerry said. A confidential report obtained by the Washington Post and published in May, says that US military officials suspect China is behind a series of hackings of designs for some of America’s most important and sensitive weapons systems. The Pentagon also named the Chinese government as the driver behind cyber-espionage against the US. US Vice President Joe Biden who launched the event said on Wednesday that despite disagreements between the two countries, “dialogue is better than confrontation”. China and the US “can serve as an anchor for world peace and stability and an engine for prosperity and development,” the Chinese vice premier said at the opening session. 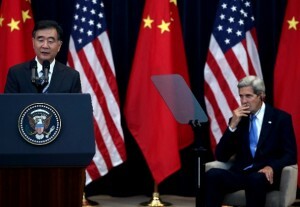 The United States and China have been holding the annual S&ED talks since 2009.